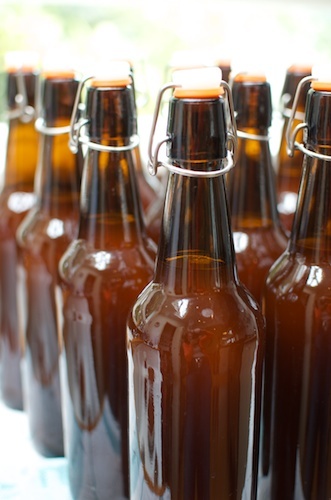 Ten days on and our brew is in the bottle. I was planning to take a note of how much it has cost so far but I’ve already blown the budget on a heat pad to keep the brew fermenting at a constant temperature and a new hydrometer to replace the one I dropped. This first batch was always going to be expensive. The Boatshed Brew was supposed to be a collaborative effort but my son Jimmy has departed for a fortnight, leaving me to check the ferment, record the hydrometer readings, add the finings and clean and fill the bottles. Also, daughter Maddie hasn’t even started to design the label so I’m thinking of re-naming my brew after the Little Red Hen in the children’s fable. (‘Who will help me bake the bread?’ said the little red hen. ‘Not I’, said the dog/cat/pig etc.) Like the lazy farmyard animals in the story, I expect my family will suddenly reappear when it’s time to drink the beer. And like the little red hen I might just drink it ‘all by myself’. I have tasted it already and although it has a fabulous aroma I think it’s a bit too hoppy. It’s also quite cloudy, despite the fining powder that was supposed to clarify it. I’m hoping it will develop in the bottle. My instructions say it will be ready to drink in three weeks. It’s a measure of how much my family has grown up that I find myself in the kitchen not baking brownies or making playdough but brewing a batch of beer with my son Jimmy. We’ve been talking about doing this for some time. Jimmy has developed a taste for craft beer while apparently studying at Otago University and I’ve been interested ever since I made a radio feature with Paul Croucher in the summer of 2004. Paul had just won a prize for the home brew he made in his garage and as he took me through the process I was thoroughly seduced by his enthusiasm. Unsurprisingly he went professional soon after and his beer regularly takes out top awards in the annual beer awards. More recently I’ve been writing a feature about Wellington’s micro brewery, the Garage Project (to be published in the Nov/Dec issue of NZ Life & Leisure). Brewer Pete Gillespie re-inspired me to give it a go. He makes beers with interesting combinations of malts and hops, playing about with the various processes and producing some fantastic beers. He has years of experience to draw on and quite wisely advises me to keep it simple. Start with a kit, get some experience and then when you’re ready, pull out all the stops. So Jimmy and I have been down at the Brew House supply store in Newtown, Wellington. 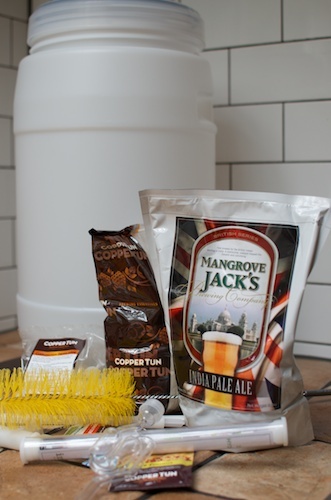 Having decided we wanted to make an IPA with a flavour reminiscent of our favourite Epic Pale Ale, we’ve bought a kit with a fermenter barrel and various bits and pieces, together with a pouch of ready-to-go malt (Mangrove Jack’s IPA) and some Cascade hops to give it a bit of a boost. It was very easy to make. Like cheese making, most of the work is in the cleaning and sterilising of the equipment. We made a guess with the hops and threw in a handful, otherwise it’s dependent upon the quality of the malt kit and the yeast that came with it. Our brew is currently fizzing away in the garage. 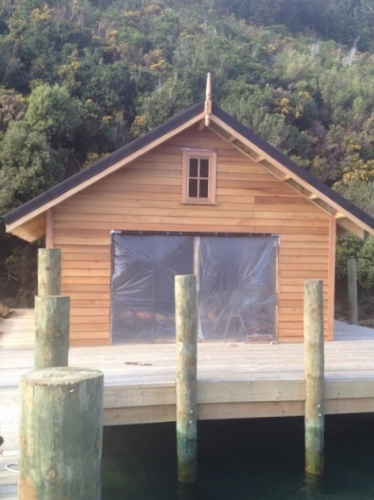 We’ve timed it be ready for the launch of our boatshed in the Marlborough Sounds. This project, several years in the making, has almost come to fruition. The boatshed and jetty have been built by father Dan, with the help of extended family and sons Jimmy and William. We hope the last nail will be hammered into place at about the same time our brew reaches perfection in the bottle. We’re calling it the Boatshed Brew. Daughter Maddie is currently designing the label and we plan to pop the caps early in the New Year. I’ll keep you posted on the progress. 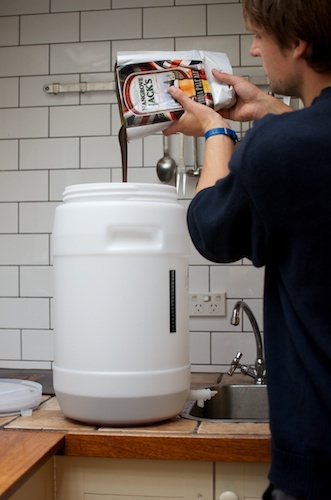 And If anyone else is interested in home brewing from a kit, I can recommend Mangrove Jack’s short YouTube videos Part One and Part Two.